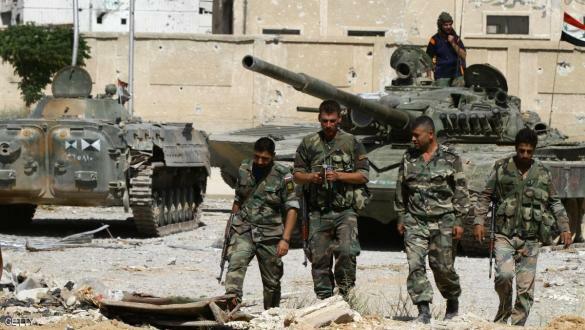 The Syrian Arab Army (SAA) troops in the Aleppo Governorate have begun gathering in the western part of the city, a military source told Al-Masdar News from the provincial capital on Friday. According to the military source, the Syrian Arab Army has made it clear to the jihadist rebels in west Aleppo that if they do not leave the Al-Zahra’a Association Quarter by October 15th, they will face a large-scale attack from the government forces. This military build-up by the Syrian Army comes just 24 hours after they announced via loud speaker in west Aleppo that the jihadist rebels have until October 15th to leave Al-Zahra’a. Due to the new Idlib buffer zone deal, which is believed to stretch to the Aleppo Governorate, the jihadist rebels are to withdraw from all areas that were established in the Sochi Agreement on September 17th. However, the jihadist rebels have yet to make any significant withdrawal from any part of the buffer zone, prompting the Syrian Army to remain on high alert in several areas. The Al-Zahra’a Association Quarter in west Aleppo has often been a staging point for jihadist attacks on the provincial capital and its surrounding area.